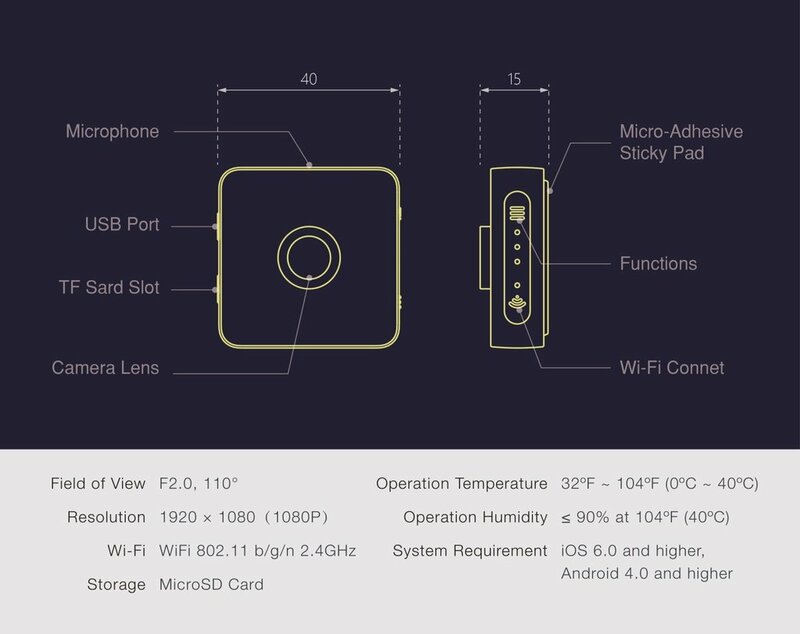 After breaking its crowdfunding goal sevenfold this portable camera allows users to take photos regardless of their environment. When you’re living life, you don’t want to have clunky cameras get in the way of enjoying things. Although GoPro and other action camera manufacturers are making smaller cameras, their devices still need to be held by hand. The makers of Foxshot are looking to make hands-free photography easier with their device – a portable, stickable mini camera, equipped with a durable gel and magnetic sheet – that clings to marble, wood, and glass. In addition to mounting the camera by sticking it onto objects, Foxshot owners are free to use a variety of accessories along with standard ¼” screws to fix it to poles, bikes, and other moving objects. Aside from the size, a unique element of the device is the replaceable camera surface which can be customized with a variety of stickers and custom designs. Hiding the camera within the environment is fairly straightforward – users just tailor a photo of the environment to Foxshot’s size, attach the tailored photo to the cameras surface, and put the camera in position. Through the mobile application, users can preview the real-time shooting screen. The device is water resistant and takes photos in 1080p (HD quality). Foxshot is sized 40mm x 15mm and weighs only 32 grams. There’s also a built-in noise canceling microphone to capture audio with minimal distortion. Foxshot supports a resolution of 1920 x 1280, is equipped with Wi-Fi 802.11 b/g/n, and supports additional storage via Micro SD cards. The device requires iOS 6.0 and higher or Android 4.0 and higher. It’s worth noting that the camera doesn’t’ have built-in Bluetooth, and isn’t designed for use as a webcam. Foxshot’s battery is designed to last for two hours during time-lapse shooting mode – which snaps a photo every 15 seconds. Users are free to change the setting via their phone. Once purchased, the mini camera is free to use – there are no subscription fees to worry about. To date, the makers of Foxshot have raised over $151,000 via crowdfunding with an estimated shipping date of August 2017. Pricing for the device starts at $39. The optional accessories pack sells for $20 and includes a: grab bag, wrist strap, handlebar mount, tripod mount adapter, universal connection adapter, flat adhesive mount, curved adhesive mount, and a variety of other components.